It’s such a moving tribute that so many are posting photos of those killed at Christchurch so that we know who it is we’ve lost. People around the world display collages of their beloved who were forcibly disappeared for decades after they were disappeared as an act of protest to demand justice. 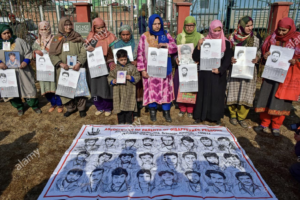 When Palestinians or Kashmiris post photos of their beloved disappeared or killed by occupation forces, it makes what they are going through very personal & meaningful to all of us. When my younger brother took his own life, all of us in the Samaritan support group used photo collages to help process our grief & still today I surround myself with photos of Paul because it helps to keep him near my heart. We all created a quilt for suicide prevention events with photos of our beloved. Photographs play a role in grieving & in the fight for justice so thank you to those posting photos of those who have died in Palestine, Kashmir, Christchurch, & elsewhere. It’s a tribute to the role they have played in the struggle against war, occupation, persecution, genocide. Because we all need a good laugh right now. Or better yet a good cry. 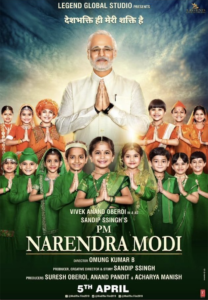 This is the movie poster for the Bollywood biopic of Modi’s life which will undoubtedly leave out the genocide parts. The movie is of course intended to sway the upcoming elections but the sniveling film producer said it’s being released early “on public demand” because “There is a lot of love & anticipation among the people & we don’t want them to wait longer.” We thought cult of personality was bad with Stalin, Putin, & some of the goofballs who’ve been US president. But this takes the cake. 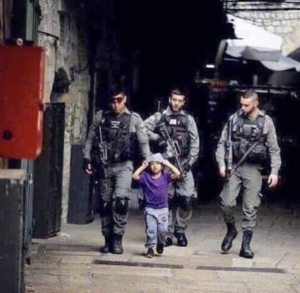 Israeli soldiers arresting Palestinian boy. The news about these Hamas gangs attacking people in Gaza should not dissuade us from supporting the Palestinian freedom struggle by one iota. Palestinians aren’t the only ones with a leadership problem. Forging an uncompromising leadership is one of the most difficult tasks in politics. More importantly, under the conditions & pressures of genocide it’s not surprising that some political forces will snap & become unhinged. Zionists & their fellow travelers have long used the politics of Hamas to discredit the Palestinian struggle as a whole. We keep our attention on building solidarity with Palestinians. If they are courageous enough to take on Israeli colonialism & apartheid, they are more than capable of forging a new leadership & stopping the Hamas violence. 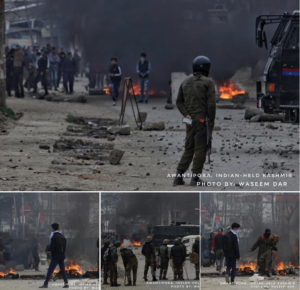 Students at the school of Rizwan Pandit protest against his murder by Indian occupying forces. “-occupation means an arrest, a torture, an intimidation, a humiliation, a cold calculated murder, a cooked up truth and a proscriptive denial. A dear Facebook friend sent me a copy of “A Letter From Manus Island” by Behrouz Boochani, the Kurdish Iranian writer denied asylum & locked up by the Australian government on Manus Island in Papua, New Guinea for almost six years. 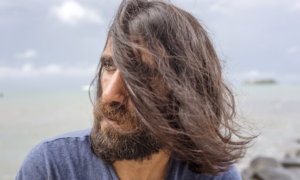 He is the recent winner of the Australian Victorian literary award for his book “No Friend But the Mountains” which was written one text message at a time.He was unable to be present to receive the award because he is not allowed into Australia & remains incarcerated for being a refugee.